What is a Thin Section Bearing and How Does it Reduce Cost? Thin section bearings are a family of bearings designed from a limited number of widths and thicknesses (cross sections), with each cross section manufactured in a wide range of bore diameters. Most radial ball bearings are designed so that as the bore size increases, the width and the thickness of the bearing change proportionately. In the case of thin “ Thin section bearings help reduce total cost in a system by allowing for design efficiency over standard bearing sizes. ” section bearings the cross section remains the same as the bore diameter increases. The thin section bearing family is made up of 12 primary cross section sets ranging from 3/16" to 1" and with bore sizes ranging from 1" to over 40". The combination of a large bore diameter in proportion to the small cross section makes these parts appear "thin" in comparison to standard ball bearings. 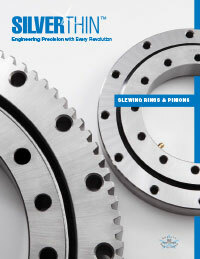 Thin section bearings are made from 52100 chrome steel and 440C stainless steel. They can also be coated with platings like thin dense chrome. Some sizes can be configured with seals or shields. Thin section bearings are also made in one of three different contact styles; radial contact, angular contact, and four point contact. These options, along with several ball and retainer types make for a diverse range of parts even among the limited cross sections of the thin section bearing family. 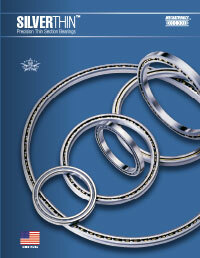 Thin section bearings help reduce total cost in a system by allowing for design efficiency over standard bearing sizes. Because thin section bearings have cross sections that don't change as bore sizes increase, there needs to be no change in the space requirements, and little change in the weight of the bearing, even as the diameter of an application increases. Especially in the case of medical equipment, airborne optical and infrared scanning equipment, and robotics, the space and weight requirements of a system are major factors in the overall design and manufacturing cost. In many cases, the price of a thin section bearing is higher than a standard bearing with a similar bore size, but application and design savings due to reduced space and lower weight decrease the total cost in the application.